Non-destructive testing specialists are attested for confirmation of their level of theoretical and practical training required for performance of work on specific kinds of non-destructive testing. 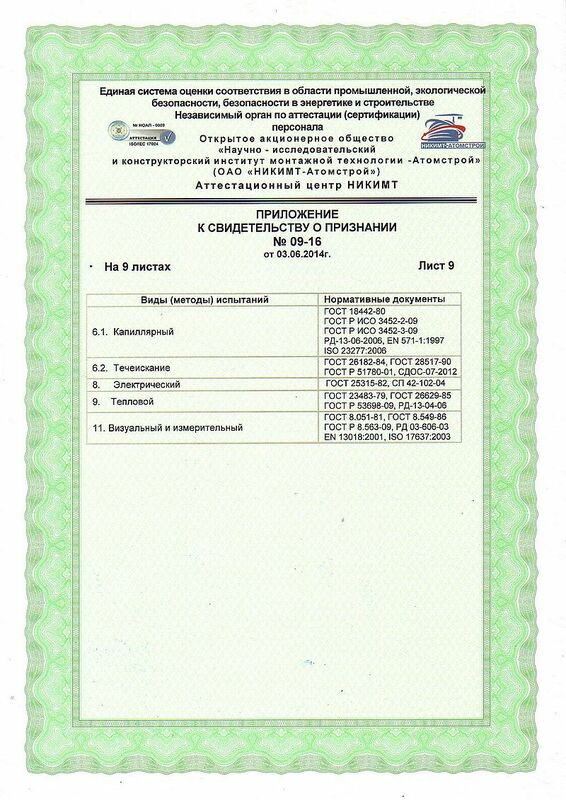 Attestation is held in compliance withи Gosgortekhnadzor rules on attestation of non-destructive testing personnel ПБ 03-440-02. *See the detailed list of objects under control in certificate. 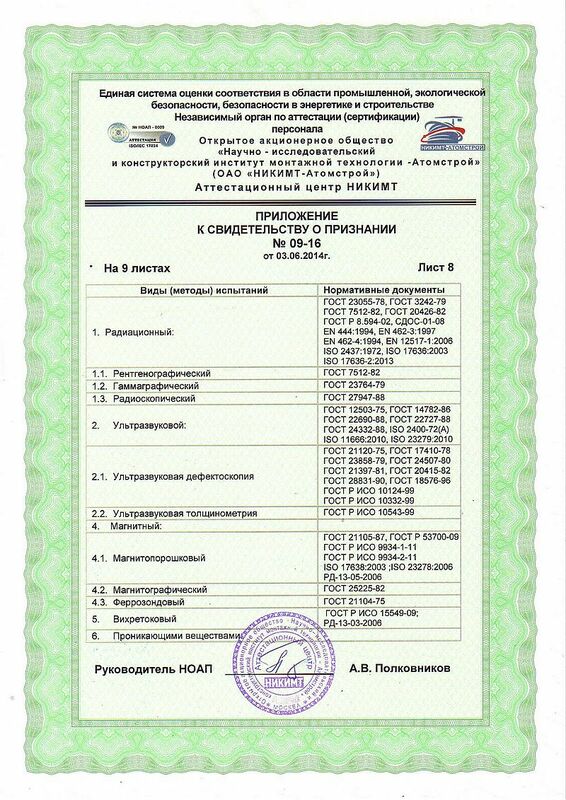 Training and attestation of non-destructive testing specialists is available throughout the Russian Federation, including the following cities: Moscow, Saint-Petersburg, Yekaterinburg, Saratov. 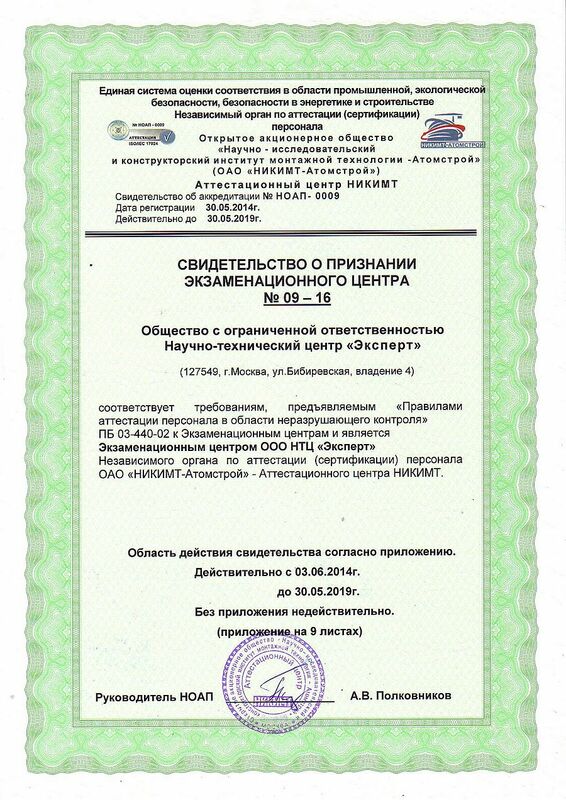 Sankt-Petersburg, Angarsk, Arkhangelsk, Astrakhan, Barnaul, Belgorod, Saratov, Bryansk, Voronezh, Veliky Novgorod, Vladivostok, Vladikavkaz, Vladimir, Volgograd, Volgodonsk, Vologda, Ivanovo, Izhevsk, Yoshkar-Ola, Kazan, Kaliningrad, Kaluga, Kemerovo, Kirov, Kostroma, Krasnodar, Krasnoyarsk, Kursk, Lipetsk, Magadan, Magnitogorsk, Murmansk, Murom, Naberezhnye Chelny, Nalchik, Samara, Naryan-Mar, Novorossiysk, Novosibirsk, Neftekamsk, Nefteyugansk, Maikop, Nizhnekamsk, Norilsk, Nizhny Novgorod, Obninsk, Omsk, Orel, Orenburg, Okha, Penza, Perm, Petrozavodsk, Petropavlovsk-Kamchatsky, Pskov, Rzhev, Rostov, Ryazan, Samara, Saransk, Smolensk, Sochi, Syktyvkar, Taganrog, Tambov, Tver, Tobolsk, Togliatti, Tomsk, Tula, Tyumen, Ulyanovsk, Ufa, Khanty-Mansiysk, Cheboksary, Chelyabinsk, Cherepovets, Elista, Yaroslavl, etc. Copyright © 2019 STC "Expert". All Rights Reserved.